Juices — The Skarlet Beverage Co.
Skarlet Virgin Series 100% varietal grape juice is far different than any non-alcoholic beverage you have ever experienced. Although our grape juices present in a manner that is similar to wine--the flavor profile is unique and stands on its own. We make our Virgin Series grape juices using a time-intensive process that preserves the grapes’ flavor and aroma, as well as all of its vital nutrients. Unlike most non-alcoholic wines (which are de-alcoholized, leaving a sharp, astringent aftertaste and a small amount of alcohol); we only use premium wine grapes, pressed with all the fresh goodness of the fruit preserved with absolutely no alcohol. Not to be confused with ordinary grape drinks; Skarlet Virgin Series is a collection of artisanal grape juices of a different order. No. 16 Rosé has complex aroma and fruity flavor. It’s a versatile alcohol free drink that’s ideal when toasting or for serving with appetizers, the main meal or dessert. Our blend of luscious catawba and bold concord grapes yields a flavorful and fruity sparkler. This delicate rosé sends up notes of wild berries with its effervescent bubbles. In Italian ‘Spumante’ means ‘sparkling wine’. Spumante does not identify sweetness level or type of grapes used. No. 18 Spumante is made with white and muscat grapes yielding a sweet juice with a floral aroma. It is the muscat grapes that give this sparkling juice a spiciness which sets it apart from others. No. 20 Glistening Catawba is made from luscious and fragrant Catawba grapes. The Catawba grape is sweet and succulent, making this pleasingly rich juice a favorite. Our Virgin Series line of juices are seasonal and produced in extremely limited quantities. Please click below to be added to our waiting list. The grape is the berry of the woody vines of the botanical genus Vitis. The diverse flavors of this wonderful fruit have been enjoyed for thousands years; eaten whole, and as grape juice. In its most-pristine and natural form, the juice of this fruit is virgin--meaning that it contains no alcohol. In order to produce wine, this juice must be fermented. At Skarlet, we never ferment our juices. 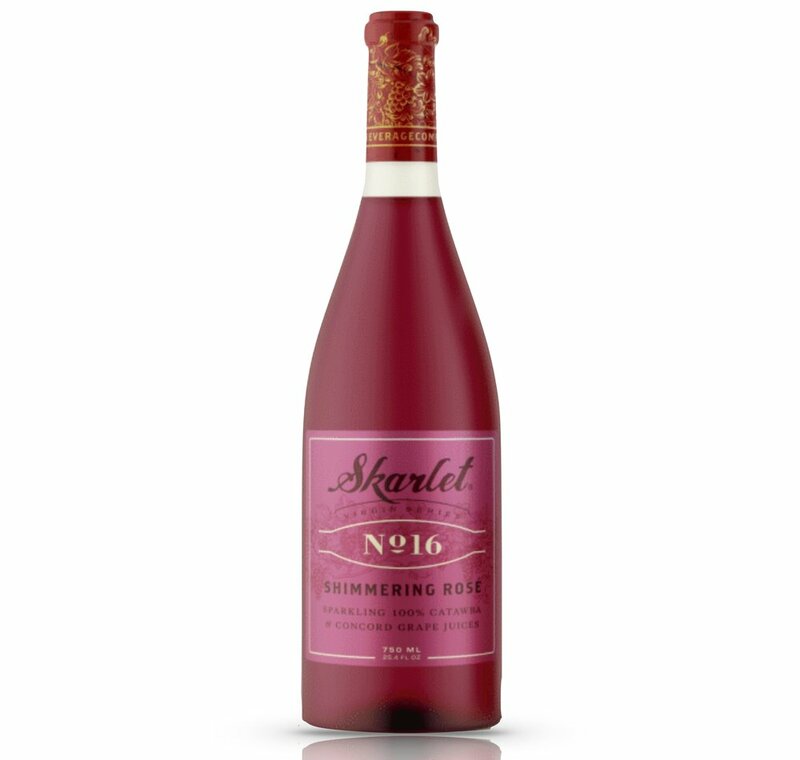 Skarlet Virgin Series grape juice is delivered to you the way nature intended--without any alcohol or any other impurity that would taint the complex, natural flavors of juice from the world's finest grape vines. Skarlet Virgin Series grape juice is 100% pure; this is our pledge. After skillfully tending the vineyard, carefully pressing the grape berries into juice, then elegantly bottling it as each grape reaches its peak; we can guarantee that Skarlet Virgin Series grape juice is a beverage of superior quality and character that your entire family can enjoy together. The natural aroma and complex flavors of the wine vinifera have a magnificent presence in our wine grape juices that cannot be found in any other commercially produced grape juice. It is not our goal to imitate wine – we endeavor to bring to you the sumptuous aromas and flavors of the grape only found in its freshly-pressed, unfermented juice. The unique flavors of Skarlet Virgin Series cold-filtered juices come from key components: sugar, acid and fruit. Likewise, all foods have flavor components (fat, acid, salt, sugar and bitter). Our chefs have discovered that the best food and juice pairings showcase complementary components, richness and textures. We encourage you to experiment with various food-juice combinations. There are no fixed rules that dictate how you should pair our varietal juices with food—it’s going to come down to personal preferences and individual tastes. As you begin your taste exploration, it may be helpful to take notes, paying special attention to the flavors and aromas that you like best. Since Skarlet presses the same type of grapes used to make the world’s finest wines, you will discover that many of the same food pairing rules apply to our varietal juices—whites before reds; dry before sweet. Just like wine, our chefs have discovered Skarlet Virgin Series juices are best enjoyed with a meal going from our lighter juices and ending with the darker varieties. The manner in which a dish is prepared will factor heavily in how our juices will pair with it. Preparation helps determine things like the texture, flavor and aroma of the dish. For example, braised foods tend to be rich and thus, pair very well with our red juices. We recommend that you pair our white and golden-hued juices with lighter foods as they compliment one another. Likewise, pair our reds with heavier foods that have robust and dominant flavor characteristics derived from strong herbs, heavy spices, or rich sauces. The best pairings will either contrast with, or compliment the inherent flavors of a dish. Riesling stands up very well to the stronger flavors and spices of Caribbean, Indian, Thai and Chinese cuisine. Chardonnay can be paired with many food types. Consider spicy southeast Asian cuisine, garlic, guacamole dips, tomato-based dishes and items featuring sweet onions. One of our favorite pairings is with "earthy" dishes like mushroom soup. Cabernet Sauvignon is a very bold and assertive variety, be careful, it has the potential to overwhelm light and delicate dishes.